bright side of the road: Sunday = Oh My Apple Pie! Sunday = Oh My Apple Pie! Sift flour and salkt into a bowl. Rub in the butter until the mixture resembles bread crumbs. Stir in 100g of sugar and the egg and mix to form a firm dough. Wrap it in cling film and let it sit in the fridge for at least one hour. Preheat the oven to 200C. Grease a tart tin or pie dish. Roll out half the pastry and use to line the dish. 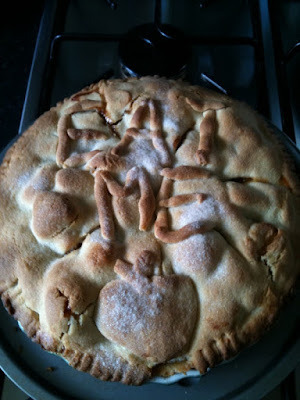 Pile the apple mixture into the pie base and sprinkle some more sugar on top. Then roll out the rest of the pie dough and put it on top of the pie. Before putting the top on I usually dabble a bit of milk along the edge of the pie to help seal the edges and after putting on the top i pinch the edges or push them down with a fork. Sprinkle a smidge more sugar on top and put the pie in the oven. Bake for 30 mins or until golden brown.